Regency Bandung has many resorts which offer beautiful scenery and interesting legends. One is the District Ciwidey located in the south of Bandung regency. 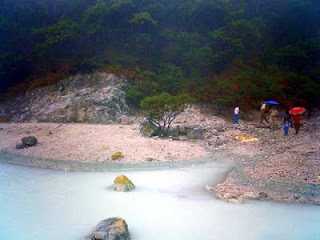 In this area there are interesting tourist attraction is Crater White. 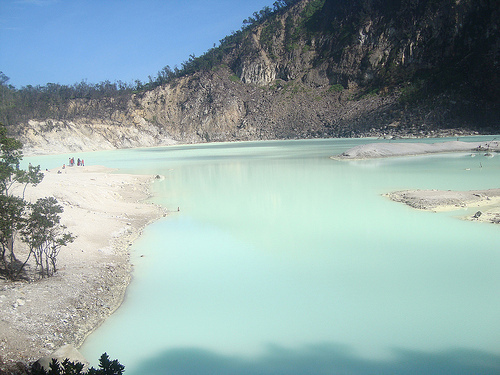 White crater is a crater lake of Mount Patuha with a height of 2434 meters above sea level with temperatures between 8-22 ° C. On top of that there is a crater Patuha Currently, when the mean low tide in Sundanese, which is in the west and below the crater White with a height of 2194 meters above sea level. Both craters were formed by eruptions that occurred at about X and XII centuries ago. White Crater is located about 46 km from Bandung or 35 miles from the capital, Bandung regency, Soreang, headed Ciwidey.